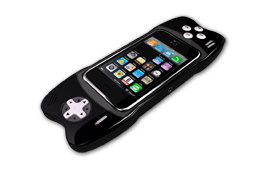 Here are some pictures and links to the iPhone compatible game controller projects that I was able to find while searching today. Of all the potential products listed here, the iControlPad seems most likely to actually be purchasable in the near future. (The creator is tweeting about his progress, and there is some amount of manual assembly required. He’s going for an initial run of 2000, and he’s at least partially completed with 500 of them.) In addition to the photo below, there is also a nice video of an iControlPad prototype in action. The GameBone also seems like they’re poised to release. The website says it’ll be available for purchase in Q4 2010. So far, the only photos are “artist renderings”, but the company have many other iPhone accessories for sale, so it seems likely that they’re the real deal. I also have some frustrations with their design, namely the lack of any analog controls whatsoever. Still, they are the only one of these projects that even mentions attempting to get the “Made for iPhone” seal of approval from Apple. That would go a long way toward making it a viable commercial product. I recently saw the Controller or Bust Project featured on TouchArcade, (that’s actually what prompted this blog post) and after checking it out some, I do like some elements of their latest design more than the competition. For instance, the form factor is not that much bigger than the iPhone is already. The dual analog sticks are symmetrically placed (as they should be, IMHO), and you can potentially flip it upside down for the analog sticks on the bottom or the top of the controller. I also like how they’ve tackled enclosing the phone quite a bit. Unfortunately, this project is probably the farthest from an actual product at this point. They’re talking about using kickstarter, but I’d really want to see a prototype (at least!) before I committed to giving them any money. Let us know if you have information about any additional iPhone game controller accessories, either in the comments, or by emailing us at info@chesstris.com.